No, the rainfall and resulting flooding wasn’t as bad as what hit in the early spring. But there is absolutely no doubt Southern Ohio got a major soaking over the recent weekend. In terms of flooding, the worst hit areas seem to have been Rarden in Scioto County and in areas of Pike County. Sciotoville also saw some high waters according to various reports. Numerous roadways were closed, although almost all were reported as reopened at the time of this writing late Thursday afternoon. Some local schools were closed yesterday because of flooding. However, Kim Carver, director of the Scioto County Emergency Management Agency, reported while some basements may have taken water, there were no reports of major flooding of any homes or businesses and the two major local rivers – the Ohio and the Scioto – were expected to crest below flood stage. How much rain fell depends somewhat upon what chart you decide to peruse. Carver said anywhere between five and seven inches hit the area, though some localized spots may have received eight or more inches of water. According to a chart on the website of the National Weather Service in Wilmington, which serves this area, the biggest rainfall locally was in Lucasville which had about 6.2 inches by 9 p.m. Sunday. The weather service reported the Rosemount neighborhood saw 5.4 inches of rain hit the ground by early Monday morning. Although, the waters rose high enough to drown out the last day of the 2018 Whitetail Deer Festival, the weather service stated Rarden saw only 4.4 inches of rain by very early Monday morning. The weather service noted this particular list of rainfall measurements was collected from several varied sources and the data listed are not necessarily official rainfall amounts. The weather service Facebook page contained a colored map depicting somewhat different rainfall totals. For example, Portsmouth was said to have received between 4.6 and 5.6 inches of rain. Just to the north, Waverley was saturated with between 4.2 and 5.2 inches of water. Rarden is not explicitly listed on this map. It does show rainfall for southern Ohio’s two major cities. Columbus showed various numbers, the highest being 3.8 inches. Cincinnati also showed varying rain totals but got a lot wetter than the state capital with just over seven inches falling in some spots. For her part, Carver was quick to point out southern Ohio did not get clobbered nearly as badly as northern Kentucky just across the Ohio River, were flooding was blamed for at least one death. “All in all, we weathered the storm rather well,” Carver said. As already stated, the last day of the local Whitetail Deer Festival on Sunday was completely wiped out by water. Various reports had vendors diving for expensive equipment before it was totally ruined. Todd Dunn was displaying trophies from his annual no kill deer hunt at the Whitetail Festival. He said volunteers went above and beyond to help him retrieve and save children’s trophies from the waters. He talked about one festival organizer being temporarily trapped underwater by a vendor’s runaway freezer. The man was reportedly unharmed. According to Dunn, vendors also escaped physical harm, but many lost a lot of expensive equipment to the flooding. He lamented the fact many have travel insurance on their equipment, but few are likely to have had flood insurance. In the Village of Piketon, Councilman Dennis Foreman said in text messages to the Daily Times that his village had been “flooded beyond belief.” Elsewhere in Pike County, he reported boats and jet skis roaming around loose on Lake White in Waverly, the Pike County seat. Homes in that area also suffered flooding, according to Foreman. 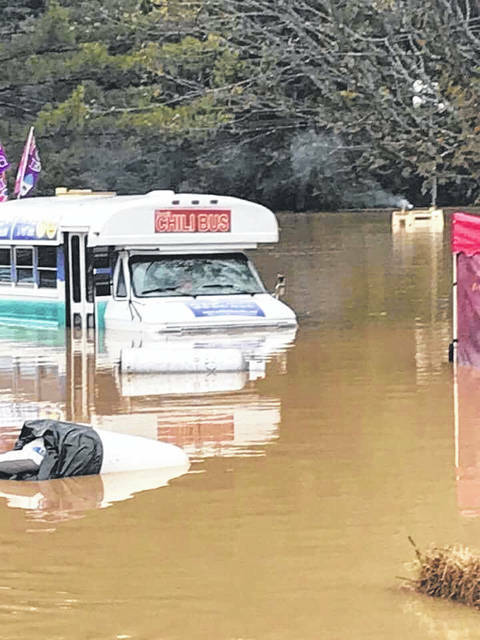 Piketon Mayor Billy Spencer confirmed many of Foreman’s comments, adding he understood nearly every school district in Pike County was closed Monday because of flooding. He said the popular campground known as Long’s Retreat Family Resort on Hollow Road was essentially underwater Monday. He also talked about some serious flooding problems on Maple Street in Piketon. For both Spencer and Foreman, the biggest worry expressed was the condition of the so-called on-site waste disposal facility under construction at the Portsmouth Gaseous Diffusion Plant in Piketon. Both Spencer and Foreman are bitterly opposed to the idea of the permanent waste disposal facility or landfill at the plant site and said this weekend’s rains are yet another example of why a radioactive dump, as they both prefer to name it, is inappropriate and unsafe. Spencer argued the recent rains were not some rare 100-year event. In Portsmouth, Acting City Manager Sam Sutherland said Scioto County’s largest city largely escaped harm. Sutherland talked about overflowing storm drains and some manhole covers floating away. He also mentioned high waters and some minor flooding in the area of the Scioto Shoe Mart in the Sciotoville neighborhood. While some reports had the city potentially firing up emergency pumps, Sutherland said that never became necessary over the weekend. He did not rule out that happening early this week as softer rains may continue and perhaps more importantly rainwater from other areas begins to reach local waterways. 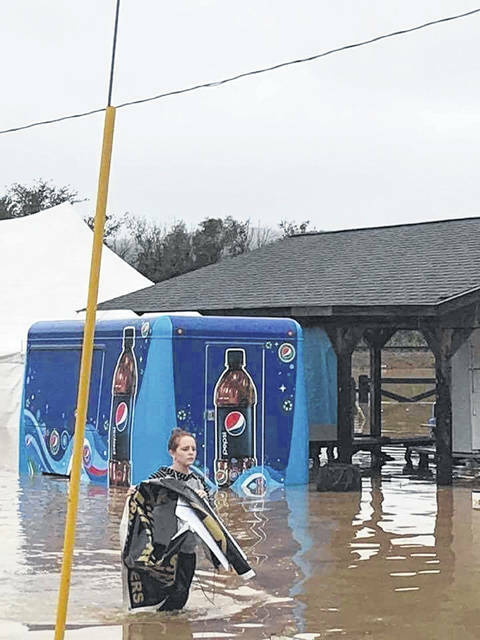 Not totally incidentally, Carver said Southern Ohio already has received some funds from the federal government in relief of the flooding that struck in the very early spring of this year. She said the individual municipalities and governmental entities in the area are now working directly with representatives of the Federal Emergency Management Agency.